God wants to restore, revive and heal marriages to what He created. We, the church must be the example for the world. The world isn’t picking up the Bible to read the word for themselves, they are reading each of our lives. Let the world see the power of God in our marriages. 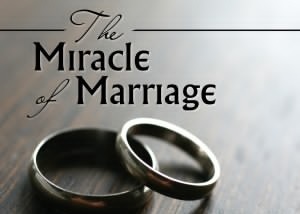 Allow God to perform a “Marriage Miracle” in your life. The world needs to see homes restored after 1, 5, 15 years plus. The world needs to see unselfish forgiveness after a husband or wife commits adultery. Let’s forget about our will…and allow God’s WILL in our lives. The Lord has allowed me to experience many difficulties in my marriage and as a result has birthed this marriage ministry. Many people don’t realize marriage is a ministry. It’s not about the husband or the wife. It’s about God, the husband and the wife. I welcome everyone... Single Waiting to Be Married, Engaged to Be Married, Don't want to be MARRIED ANYMORE, Been there Done That…MARRIED and LOVING IT!!! featuring guest speaker: "Mrs B"
sharing her testimony of what the Lord has DONE & DOING in her 28 years of MARRIAGE. starting @ 9 PM til 11PM, Eastern time zone.